PHILADELPHIA — When tendons get irritated it can lead to a serious condition called tendinosis — a common class of sports and workplace injuries — which is also common in older individuals. It can take many weeks of rest for tendon irritation to heal, with no treatments, save short-term steroid injections and surgery, followed by more rest. New research on the biology of tendon irritation from Jefferson (Philadelphia University + Thomas Jefferson University) pinpoints key molecular components of injury, opening the possibility of targeting the pathways with pharmaceutical and other interventions. 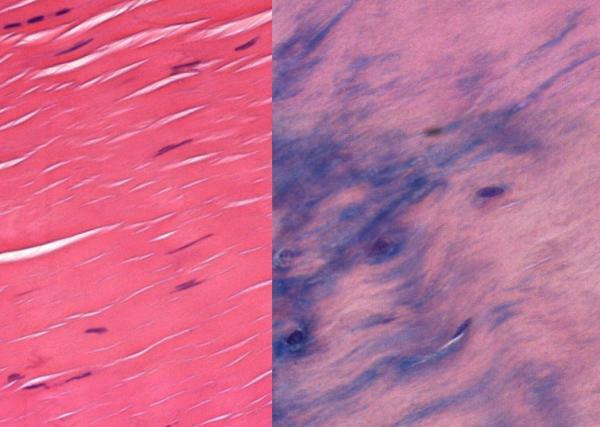 Other research has shown that tendon cells change shape under compressive forces, becoming tougher and more like the cartilage in the knee meniscus. Research also suggested that as people age the blood supply to tendons decreases, leaving them starved of oxygen. “Our analysis links these two avenues of research, showing that decreased oxygen is a key event that leads tendon cells to go from healthy to tougher and less flexible, resulting in tendinosis,” says McBeath. The results were published March 28th in the journal Aging Cell. Dr. McBeath and colleagues examined tendon samples from patients who were undergoing surgery for tendinosis and compared tendons from elderly versus young patients. Under normal oxygen levels, the tendon cells retained a normal shape and flexibility. But when those cells were grown in low-oxygen levels, mimicking the low-oxygen environment common in older people, the tendon cells changed shape, and became round and more similar to tough cartilage-like cells, called fibrocartilage. When oxygen was low, the aged tendon cells also reduced the activity of a signaling molecule called Rac1. Rac1 is involved in many cellular processes, including those governing cell shape, movement and growth. With reduced Rac1, the tendon cells began to change shape, but only in low-oxygen conditions. When the researchers blocked Rac1 activity in high-oxygen conditions, tendon cells were able to retain their normal shape. The next steps for the work are to learn more about how manipulating oxygen levels, and the downstream signaling molecules Rac1 and others, might change tendon tissue. If the researchers find a way to increase Rac1 production in tendons, they might be able to help tendon cells keep their shape and thus prevent tendinosis. These studies were funded by National Institutes of Health/National Institute of Aging R03 AG048118, American Geriatrics Society/Jahnigen Foundation, OREF, ASSH, and the Hand Rehabilitation Foundation. Article reference: Rowena McBeath, Richard W Edwards, Brian J O’Hara, Mitchell Maltenfort, Susan Parks, Andrzej Steplewski, A. Lee Osterman and Irving M. Shapiro, “Tendinosis develops from age- and oxygen tension dependent modulation of Rac1 activity,” Aging Cell, DOI: 10.1111/acel.12934, 2019.